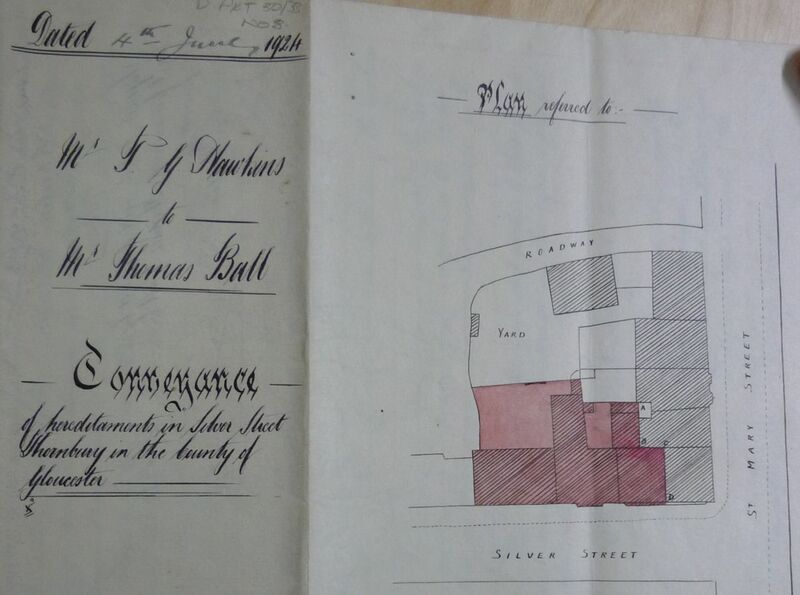 We are grateful to South Gloucestershire Council for allowing us to copy the deeds of 5 Silver Street in Thornbury and the properties that composed it. The photograph on the left shows the property in the 1900s, and we suspect that this building was rebuilt or certainly re-developed in the 1920s. We are fortunate that the property was one of several properties in Thornbury owned by John Hylpe (or Hilpe). An indenture dated 1604 shows John arranged for subsequent owners of several of his properties to pay a sum of money each year to the Mayor for the benefit of the poor. In the case of this property it was described as being ‘out of another house in Chipping Street in the said Borough 4/4’. Chipping Street was the old name for Silver Street. We have been fortunate to find the Mayors Accounts which have given us details of the various occupants of the property since that time. William Jones – the indenture dated 1st June 1604 listing the properties included in the Hylpe Charity shows William Jones as the occupant of the house in Chipping Street. The Mayors Accounts from 1619 to 1638 show William as paying the rent charge of 4s 4d on this property. William was Mayor of Thornbury in 1636/37. The references to the list of local people who contributed to the town clock that William was a shoemaker. William was the son of Thomas Jones who died on 10th May 1620 aged 98. In 1616 William had appeared in Borough Court as a result of a dispute between him and George Morse. William requested a judgement regarding the responsibility for an elm tree and the Court judged that the tree belonged to William because it was growing within his bounds. William died on 8th January 1640 aged 76. There is a gap in the accounts between 1639 and 1641 when William’s widow, Elizabeth is shown as having taken over as the owner. She is listed up to and including 1653. Timothy Hasker (or Harker) – the account records show Timothy was the owner of the property from 1655 to 1678. Timothy’s name appears in several of the early court rolls we have seen where he appears to be acting as the attorney or agent for someone having to appear before the court. Andrew Buck – the Mayors Accounts show that Andrew Buck was paying the rent charge on the house from 1679 to 1737. In view of the fact that this means that Andrew was there for 58 years, it is possible that there were two generations of Andrew Buck owning the property. It is also strange that Andrew was a regular paying of his rent charge up to 1718. From that time to 1737, Andrew’s name appears under the ‘Arrears column’. What is even more strange is that although it indicates the rent charge is 4s 4d, the figure is crossed through in each year and overwritten with zeros. It appears as if there was a special arrangement to overlook Andrew’s debts. Deeds relating to other properties in Thornbury show that in 1708 Andrew had bought an orchard on the site of 16 to 20 Rock Street. He was described as as currier at that time. On 21st July 1716 Andrew and his wife, Sarah, sold the orchard. An indenture dated 29th June 1724 mentions Andrew was living in a house on the site of 15/17 St Mary Street. The parish records in Scribes Alcove (which only record the baptisms since 1700) show that Andrew baptised two daughters, Katharine and Martha on 25th August 1700. We found on the Internet a reference to Andrew Buck of Thornbury in an exposition on the common prayer by Laurence Clarke and Samuel Butler 1737. It says: “some days ago died at Thornbury Mr Andrew Buck aged 96 who was married to his second wife upwards of 66 years and has a child living by her near that age and one much older by a former wife who attended at his funeral though very infirm through age”. George Buck – from 1738 to 1744 George Buck is listed in the accounts records, although again his name appears in the ‘Arrears’ column and the amount owing has been overwritten with zeros. George was the son of Andrew Buck. An indenture relating to the adjoining property mentions that George was also a currier like his father. We are not sure what George did with the property, but Mayors Accounts indicate that it was taken over by John Grove in 1747. John Grove – John was listed as the owner of the property up to 1769. John was a butcher. According to family trees on the Ancestry website John was born or baptised on 19th December 1697 and married Ann Cossham. John and Ann had several children: John baptised on 19th February 1728 who was buried on 1st March 1728, Hester baptised on 5th October 1729, Ann was buried on 6th May 1733, another Ann and Betty both baptised on 27th July 1735, Elizabeth who was buried on 13th August 1737, another John baptised on 26th August 1737, another Elizabeth baptised on 24th October 1739 who died 17th September 1757 aged 17 and Thomas and Sarah both baptised on 24th August 1743. John’s son, the second of those he named John, is buried in the same grave as his parents and called ‘John Grove Jnr’. The older John was called John Grove snr. Both of them were butchers of Thornbury. Ann died on 29th January 1764 aged 60. John died on 25th July 1770. The age given on the transcription of the monumental inscription gives John’s age as 71. However the transcription of the parish burial record (as given on the Scribes Alcove website) show the age as ‘upwards of 72’. Thomas Grove – Thomas Grove was listed as the owner of the property from 1770 to 1786, when Ann Grove took over as owner. Thomas was the son of John and Ann Grove mentioned above. He was baptised on 24th August 1743 and became a butcher like his father. On 29th November 1767 Thomas married Anne Wetmore, the daughter of John Wetmore. Thomas and Ann had at least five daughters and five sons; Sarah born on 17th September 1768, Elizabeth born 31 December 1769, Ann born 28th January 1771, William born 5th March 1772 who died aged 8 months and was buried on 2nd January 1774, Esther born 9th June 1773, Maria baptised on 15th March 1775, Thomas born on 25th April 1776 and baptised on 5th June 1776, John Wetmore born on 24th August 1777 and baptised on 24th September 1777, Samuel born on 28th March 1779 and baptised on 19th May 1779 and their tenth child, appropriately named Decimus born on 29th September 1780 and baptised on 18th October 1780. It is astonishing that only one of their ten children should die young. By two indentures dated 23rd January and 30th of January 1770 Thomas bought for £84 a mill house and orchard “containing by estimation one acre.” This was located on the site of 1 Bath Road. On 17th January 1787 Thomas sold this property to Anne’s sister, Hester Wetmore for £150. It is worth mentioning that Thomas Grove is listed in the land tax records of 1775 through to 1784 (the only ones we have seen for this period) for two properties. The first property is listed as being ‘for Bucks’ and showing that the sum redeemed was 2 shillings. The next entry in all these records was another property owned by Thomas Grove – this was described as being ‘for Barn’ and the sum redeemed was 1 shilling and 6 pence. Thomas Grove was Mayor of Thornbury in 1779/80. We believe that Thomas was buried on 16th January 1788. His widow Anne Grove was listed as owner of the property until her death. She died aged 51 and was buried on 15th March 1796. In Anne’s will she left her house at 5 Silver Street to Thomas and Anne on condition that they live there and allow any of her other children to live there. Her personal was estate to be divided between all her children, but in a codicil she left out Thomas and Anne. Thomas Grove – the Mayors Accounts show Anne was replaced in 1797 by her son, Thomas Grove. Thomas is shown as owner and occupant of the property in the land tax records of 1796, 1797 and 1800. In 1809 the land tax records show that Thomas was now letting the property to Charles Gayner. In 1814 Charles takes over as owner and occupier of the house and the adjoining barn. We don’t know what happened to Thomas. On 2nd August 1856 the property was sold by the trustees of Charles Gayner to William Henry Councell. “all those two messuages or tenements formerly in one site in Silver Street formerly known as Chipping Street in the respective occupations of John Thomas and (blank) with the bakehouse stable yard and premises thereunto adjoining and belonging which were purchased by the said Charles Gayner of one Thomas Grove”. On 12th June 1903 Ellen Hannah conveyed the property to her daughters. Ellen died on 9th October 1907. Of the daughters, Ellen Winifred died on 31st January 1919. On 17th May 1923 Alice Mary Councell and Amy Brown Councell both of 15 Maurice Road, St Andrews, Bristol and Edith Caroline Councell of 304 Walworth Head, London sold the property to Phillip George Hawkins for £305. The property was described as being ‘all that messuage or tenement on the north side of Silver Street now or late in the occupation of Graham Williams and also the bakehouse or stable yard and premises adjoining on the west side thereof all which said premises. Click on the thumbnail on the left to view a plan showing the property in 1923. The old bakehouse is on the left. Thomas Ball – Thomas bought the property from Phillip Hawkins on 4th June 1924. At the time of the purchase of the property Thomas was a farmer living in Shipperdine. The price of the property was £1225. Note the bakehouse became used as a garage and stable yard. The house became known as ‘Empire House‘. As can be seen in the photo on the top of the page, the shop was to the right of the house, one of the two lock up shops recently built by Phillip Hawkins. Thomas was a builder. Planning applications held by Gloucester Records Office show Thomas had built a cowshed at Oak Farm in Oldbury in 1910. When Thomas moved to Silver Street he ran a business there as a portable house builder. We suspect that he was also the buyer of 54 High Street as on 30th April 1925 that house was bought by a Thomas Ball, for £595. He appears to have let that property out to tenants. On 31st January 1945 Thomas Ball of Sunny Bank Farm, Andoversford sold 5 Silver Street to Thomas Henry Ashcroft for £1850. Thomas Henry Ashcroft – Thomas bought the property on 31st January 1945 for £1850. On 9th October 1947, he also bought the house at 4 St Mary Street for £300. Thomas was described as a motor engineer at the time of the purchase in 1945, but he specialised in motor cycles and cycles. Thomas was born on 1st January 1911, the son of Albert Ashcroft and his wife, Annie Louise (nee Gingell). Tommy married Felicia Turner in Thornbury in the December quarter of 1936. They had two children Sally born in 1941 and John in 1944. We have been told that Tommy and Felicia bought the “Firs” at Milbury Heath and they moved there while still running his business in Silver Street. We think Thomas rented out 4 St Mary Street to other families during his ownership of the property. On 24th June 1954 Thomas Ashcroft conveyed 4 St Mary Street to Grantley Charles Parsons of the High Street for £450. On 30th August 1957 Thomas died aged 46. We understand that he died at 4 St Mary Street which had been bought by his mother. His address at the time of his death was The Firs, Grovesend. Tommy died intestate but letters of administration were granted on 10th March 1958 to Thomas’s widow, Felicia Margaret who was living at The Firs. On 8th December 1958 she conveyed the property to Henry Percy and his wife, Hilarie Madge Horder for £2450. Felicia married Dudley John Cullimore in 1971 and finally moved to live in Shirehampton. The Horders – Henry Percy and Hilarie Madge Horder were stationers trading and living at 22 High Street when they bought 5 Silver Street in 1958. The 1961 electoral register shows that their son, Alex David Horder and his wife, Betty, were living in the house. On 21st February 1962 Henry and Madge, then living at Willow Tree Cottage, The Knapp, sold the property to Dora Regina Spiller of 10 Hillcrest for £3850. Dora Regina Spiller – Dora bought the property at 5 Silver Street on 21st February 1962. On 3rd April 1959 she had leased the shop at 7 Silver Street for 14 years and had used that property as a hairdressers trading under the name ‘Dorinas’. On 3rd April 1967 Dora agreed with Thornbury Rural District Council to sell it the property at 5 Silver Street, together with the remaining years of the lease of 7 Silver Street. On 24th September 1969 Dora sold 5 Silver Street to the Council for £11,950. Her address at that time was The Farm Bungalow, Bristol Road. Dora was the daughter of Reginald Baker, a chauffeur. In 1934 she had married Henry J Spiller in the Bristol area. She was a widow when on 24th July 1967 she married a shop manager, Kenneth Lile Merriott, in Thornbury Register Office. The property was demolished by the Council and the land incorporated into St Mary Shopping Arcade. Note the image on the left shows the property prior to demolition. The building on the left of the house was the old bakehouse later used as a stable.